Meet at 8 AM near Donut Delite at the corner of Madera and Royal. Bring 2 to 3 quarts of water and lunch/snacks. Wear boots. We’ll climb up to Mountclef Ridge via the Santa Rosa trail, then descend to the paved road, following the Box Canyon trail up to Lizard Rock. 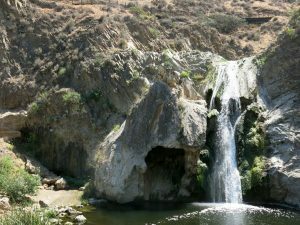 Next, we’ll go to Paradise Falls, then follow the stream back to the parking area.